First Icelandic Craft Beer Arrives in U.S.
California Gets First Taste of Three Arctic Craft Ales. More than a thousand years ago, Icelanders were the first Europeans to discover North America — now it is time for North America to rediscover Iceland. Einstok Olgerd, an Icelandic craft brewery, has announced that the first shipment of its unique ales has landed in the United States. Initially, an Icelandic White Ale, Pale Ale and Toasted Porter will be distributed in California in a partnership with Wine Warehouse, one of the largest distributors in the United States. Located just 60 miles (100 km) south of the Arctic Circle, Einstok — which means “unique” or “distinctive” in Icelandic — starts its process with the perfect foundation for brewing craft ales: the purest water on earth. The water starts as rain or ancient glacial water from atop the HliA deg arfjall Mountain, from where it flows through and is naturally purified by ancient lava fields. From there, brewmaster Baldur Karrason unites it with ingredients sourced both locally from Iceland and from all over the world to deliver craft beer that is distinct and flavorful, yet deliciously refreshing and drinkable. Icelandic White Ale: brewed in the centuries-old Belgian tradition, this ale features the complex flavors of the classic wit bier, including coriander and orange peel, all brewed with pure Icelandic water that delivers a cool smoothness that is flavorful and refreshingly drinkable. Pale Ale: American and Bavarian craft come together to create the Viking version of the Pale Ale. Mild, slight toffee flavors and generous hop aroma flood this ale with taste, brewed harmoniously with nature’s finest Icelandic water. Toasted Porter: With clear notes of espresso and dark chocolate, this Porter is dark and rich, offering a medium body that is robust — yet smooth and seriously easy to drink. Be afraid of the dark no more. Einstok Olgerd was founded n 2010 by Bernard La Borie, David Altshuler and Jack Sichterman after visiting Akureyri, Iceland, on a global search for the purest water. They found not only an abundant natural source of pure water there, but also a partner, the Viking Brewery, a division of Vifilfel hf., that was interested in pursuing the craft beer market. 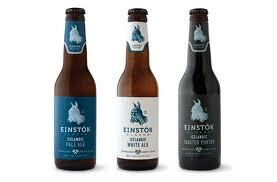 Einstok craft ales have been available in Iceland and the United Kingdom since October 2011 and have been gaining fans quickly thanks to their great flavor and unique packaging. To find out more, visit www.einstokbeer.com .